Search engine optimization has been around since the mid-1990s when web designers began to catalog their sites for the new search engines. While it used to be a much more complicated process, there are still some archaic myths out in the market that no longer need to be used for SEO in 2015. SEO seems to morph into a new beast with each algorithm update. Each of these updates seems to create another practice that is outdated and no longer necessary. The field has changed a lot in the last 20 years; however, there are a lot of misconceptions as to what SEO is and how it can (and can’t) benefit your company. 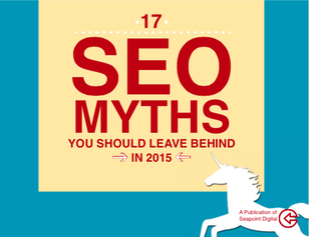 Our new book ’17 Myths about SEO Debunked’ helps clear up some of the miscommunication. This book busts many myths about SEO, one of which is determining the necessity of Google Authorship as an SEO marketing strategy. Let’s take a look at the first myth in ’17 Myths About SEO Debunked’ before you download the book the check out the remaining 16 myths. While Google Authorship was technically an experiment, the program was the ‘it’ word for SEO strategy during its three years of existence. With Google Authorship, the author’s information, such as the byline and a picture, would appear next to the article’s headline and would be part of the search results. The more content the author created and attributed to his name, the more ‘trustworthy’ he was to Google and thus the higher his content would appear in the search rank. There have been a number of Google projects that have not met Google’s standards and saw an early death. This is exactly what happened to Google Authorship. Google is all about the data and when they saw the low adoption from both webmasters and users, the search company decided to pull the plug on the whole project. With Google Authorship in the past it will be interesting to see how Google continues to push users to Google+, it’s social networking platform. Time will have to tell. If you talk to anyone who’s bread and butter is SEO, they can probably recite the quote ‘the only thing that doesn’t change in life is change itself.’ Google Authorship is a prime example of that. SEO is an ever-changing field and requires a full understanding of the major decision makers within the field and how they affect your marketing strategy. Do I have to submit my site to Google? Should I worry about links or content? Can’t my IT department do my SEO? Do I need more pages on my website to rank higher? This ebook is an excellent way to make sure your SEO marketing strategy isn’t in the dark ages. With each new algorithm, SEO changes its shape – it morphs into a new beast that needs to be mastered. Make sure you’re using the correct tools to get the job done. Our new ebook is free to download, but if you need any help implementing a new SEO strategy, Seapoint Digital is here to help.